Wikipedia’s distinctive layout and styling is a direct result of MediaWiki, the software used to power it. MediaWiki is a free, open source wiki application that many web hosting companies offer on their plans. If you need to set up a wiki for a project, MediaWiki should be on your list of potential solutions. MediaWiki was originally released specifically for Wikipedia in 2002 after the site had launched. The online encyclopedia found that its original platform, UseModWiki, was slowing down as it scaled up, and it needed a better way to host the huge number of articles it held. Wiktionary is a multilingual project designed to create a free content dictionary of all words in all languages. It is collaboratively edited via a wiki, and its name is a combination of the words wiki and dictionary. Wikiquote is a free online library of sourced quotations from notable people and creative works in every language. It also includes translations of non-English quotes and links to Wikipedia for further information. The guide can also be edited and updated by other users worldwide. An awesome place to contribute and inspire. Wikibooks is a project for collaboratively writing open-content textbooks that anyone can edit. Wikibooks has two sub-projects; Wikijunior which is aimed at children and the Cookbook, collection of recipes and culinary topics. Wikiversity showcases learning resources, learning projects, and research for use in all levels, types, and styles of education. The project aims to create an open source, open education platform. The third, stable version of the MediaWiki application took around a year to bring to the fore. The main developer was Magnus Manske, who switched from Perl to PHP and used MySQL as the backend database. The code was soon rewritten by Lee Daniel Crocker and released to the public in 2003. Its foundations have stood it in good stead since it was designed to handle massive amounts of content and huge visitor numbers. MediaWiki has essentially been tested by one of the busiest and most demanding sites on the planet, and it shows. Thousands of customers are confident in its abilities; it is used by diverse clientele including the US government and WikiLeaks. Who's Best for MediaWiki Hosting? We think SiteGround is the best choice for MediaWiki. The software is a free and open source. It is developed and patched by a large number of volunteers and a small team of development staff and continues to be updated and improved. Due to MediaWiki’s popularity, almost all web providers offer it as an optional install through their control panels. There are plenty of installation guides online, including official resources. You can also install MediaWiki using a package manager, such as apt-get on Debian/Ubuntu systems. MediaWiki works best on Unix/Linux servers. MediaWiki should cope with small and large databases alike, but it will be limited by the type of hosting account you have, should it begin to tax the server. You will need sufficient resources to cope with the traffic you’re getting, and you may need to liaise with your host if you exceed reasonable limits. The purpose of the web server is to serve the requested pages to the client browser. It is one of the key requirements and necessary for the Mediawiki service to function. This is usually provided by your hosting provider. This is the programming language in which MediaWiki is written, and is required in order to run the software. PHP version 5.5.9 or later is required for the latest stable version of MediaWiki. MediaWiki stores all the text and data in a database, which is then shared with other web-based applications. You will need one of the following database servers to run the latest version of MediaWiki: MySQL, PostgreSQL, SQLite, or MariaDB. It is recommended to use 256MB of RAM 85MB of storage for a single computer Media Wiki installation. However, it should be noted that this may not be enough for a busy public site. Some users have reported running MediaWiki on as little as 48MB of RAM according to the official MediaWiki website. Additional functionality such as image thumbnailing and email sending can be added using a range of additional optional dependencies. These dependencies, including SendMail, ImageMagick, and Shell Access are not essential for MediaWiki installation. You can also use an alternative web server like Nginx. A lot of the tutorials out there and the user community will assume a Linux or other Unix system. Even the cheapest shared plans will exceed the minimum system requirements, but a well-trafficked wiki will tax a server quickly. Even better is a hosting provider that will install MediaWiki for you. This will save you a lot of time. Your host will also keep up with the latest updates, which is important for security. Aside from Wikipedia, MediaWiki has been used for other projects developed under the Wikimedia brand, including Wiktionary. It supports specialized content, such as mathematical formulae, hieroglyphs, and media galleries, making it suitable for practically any purpose. Thousands of other users run their own wikis on the web, on internal intranets, and in schools. Perhaps the most fun of them all, a wiki community for gamers! Communities have sprung up to host wikis outside of the Wikimedia network sites. There are some niche hosts that specializing in hosting wikis for specific subjects, such as Gamepedia for – you guessed it – gaming, and Biowikifarm for biology. Permissions can be granted to users or groups, and users can automatically be added to a group when their behavior fits a particular pattern. For example, a user that edits articles frequently could be promoted to a group with more rights than a casual editor. Admin users have ultimate permissions, including the ability to change the way the wiki software looks. Despite powering large wikis, MediaWiki is perfectly fine for wikis on smaller shared hosting accounts with a small community of users. This is what MediaWiki looks like. MediaWiki uses a particular type of markup, known as MediaWiki syntax. This is different from HTML code, yet follows similar conventions. It’s designed to be easy to use for non-technical editors and was designed specifically to be readable. Despite this, users will almost certainly need a cheat sheet to create formatting and insert images. There’s also a toolbar that makes it much easier to quickly format text without typing the syntax by hand. A visual editor is also available for WYSIWYG editing. Links are the primary method of navigation, and MediaWiki automatically detects broken links so that users are prompted to fill in blanks and expand the content. Users can also put their topics into categories and subpages, and there’s a search box to find articles fast. MediaWiki also has sophisticated tools that make it easier to control edits in real time. If two users go into a topic and edit it, MediaWiki recognizes the potential clash and tries to combine the edits into one. The application audits edits and lets users review them and potentially reverse them. Users can flag particular topics as ‘watched’ to keep a close eye on edits performed by others. Like many PHP applications and scripts, MediaWiki’s flexibility is enhanced by its plugin library, which currently contains more than 2,000 different extensions. These extensions add new features or change the functionality of the core application. Users can write their own. Many web hosts offer MediaWiki as one of the CMS packages that can be installed. The best option is to use their version if it’s available through your host’s control panel. The initial configuration of MediaWiki is through a form that the administrator navigates to after unpacking the MediaWiki files. You just put in the information that MediaWiki needs to run, such as the database location and the username and password. You also perform other configuration through a configuration file, LocalSettings.php. You can download this file via FTP, edit it on your computer, and then upload back to the server. SSH access is useful if you’re comfortable using the command line. This way, you can edit the file directly when you need to make changes, such as pointing MediaWiki at a new database or installing a custom theme. Editing this file is straightforward. It’s in PHP, but you don’t have to have extensive knowledge of the language. It’s just a list of variables that are mostly self-explanatory. You just change the values you want to change and save it. MediaWiki also has hundreds of options in its settings pages and has been translated into more than 300 languages. Its appearance can be controlled with CSS and scripting. All edits to the themes are carried out within the wiki software, although the permissions should be locked down to admin users only. Note: in MediaWiki, templates do not refer to the appearance of the page layouts. Templates are snippets of content that can be planted into pages and automatically displayed. It’s time to take a look at my favorite hosts offering an easy way of utilizing MediaWiki. These include easy-installs and ready to go versions of MediaWiki itself. You’ll want a hosting provider that gives you room to grow as more users add pages to your wiki. This company is an example of a hosting provider that doesn’t specialize in MediaWiki but makes it easy to host MediaWiki sites. SiteGround is the one we recommend. They also have unlimited MySQL databases for MediaWiki projects. Even better, the company offers MediaWiki pre-installed. SiteGround can also migrate wikis from a pre-existing installation to the new server. Bluehost is another MediaWiki-friendly web host. The company offers shared, cloud, or dedicated servers. Like SiteGround, it offers SSH access, across its service tiers. While it also offers one-click installs, MediaWiki didn’t seem to be mentioned. That’s not a dealbreaker, as it’s easy to install MediaWiki on your own. Bluehost offers shared, cloud, dedicated server, and VPS hosting. Even cheaper is HostGator, starting at $2.43 a month. As with SiteGround, HostGator can migrate an existing wiki hosted elsewhere. Similar to Bluehost, the company doesn’t have a dedicated MediaWiki plan. MediaWiki is a one-click install over Bluehost’s regular hosting. The lowest tier includes a single domain and one-click install and unmetered bandwidth. HostGator is good for people new to hosting wikis. Very few web hosting providers specialize in MediaWiki, so if you want to host a MediaWiki site, you’ll want a hosting provider that hosts its dependencies, PHP and MySQL. All of the major web hosting providers support these, with many of them making it easier to get started with MediaWiki by setting up the prerequisites and even installing MediaWiki for you. Be aware that many of the cheaper plans are on shared hosting servers, where your wiki shares a server with other websites. If your wiki gets a lot of users making edits, you’ll want to move to a VPS. In the meantime, let’s sum up a few ups and downs of MediaWiki, which are noteworthy. Popular wiki with the large user base. Can be difficult to configure. Requires configuration through a text file. Changes in the web server, PHP, or database can break the wiki. MediaWiki is a free, open source software application used to create online wikis: encyclopedia-like websites that allows collaborative editing by their users. It was first created specifically to run Wikipedia, but is now available for public use. Who develops the MediaWiki software? MediaWiki was first developed in 2002 by Wikipedia editor Magnus Manske to run the Wikimedia Foundation’s websites, including Wikipedia.org, Wiktionary.org, and Wikimedia Commons. The software is now maintained by the Wikimedia Foundation, with its Chief Technical Officer now responsible for managing its development and the release of updates about every three to eight months. In addition to Wikimedia Foundation paid staff developers, there is a large active community of developers who contribute to the project. What is MediaWiki used for? MediaWiki was originally created specifically to run Wikipedia, and its main application is to create wiki-style websites. However, MediaWiki lends itself to many other uses for structuring website content. It has been used to manage knowledgebases and documentation; to create news sites, blogs, or personal websites; collaborative educational group projects; internal company sites; and for rapid document prototyping. Notable websites that use MediaWiki include wikiHow, WikiLeaks, Conservapedia, Scholarpedia, and the United States Intelligence Community’s Intellipedia. Yes, MediaWiki is available as a free download from the official MediaWiki website. It is open source and licensed under the GNU General Public License, version 2. What is MediaWiki written in? The MediaWiki software is written in the PHP programming languages and can store its information in a MySQL, PostgreSQL, or SQLite database. Is MediaWiki scalable for growing projects and websites? Since it was developed to run Wikipedia, a huge, high traffic website, MediaWiki has optimized for performance and scalability throughout its development. It uses many different methods to improve its performance, including various caching and data compression tools. What are some of the key features of MediaWiki? MediaWiki has many features that make it a popular choice for creating wiki sites. It has a strong focus on multilingualism, making it ideal for sites in multiple languages. MediaWiki uses a lightweight markup system designed to be simpler than HTML, making it easy for non-technical users to contribute. There are many options for tracking edits, including the ability to see all the edits of a specific user, or the ability for individual users to add pages to a watchlist and be notified of any future edits. MediaWiki also has many features that make it easy to structure and navigate around large amounts of information. The MediaWiki software is also very adaptable via thousands of extensions, or PHP hooks for developers. Are there any drawbacks to using MediaWiki? Some MediaWiki users cite having technical trouble using the editor interface, making it difficult to participate in editing the wiki. Since no formal MediaWiki syntax has been defined, there are no WYSIWYG (What You See Is What You Get) editors available for MediaWiki. Is support available for MediaWiki? Support for MediaWiki emphasizes a DIY approach to problem solving. There’s a support desk on the official MediaWiki website where you can ask for help, but they encourage users to search through the documentation before you post a request for support. There’s also an official mailing list, called Mediawiki-l, and there are several prints and online books about MediaWiki administration. How does MediaWiki compare to Confluence? Confluence is a team collaboration software application written in Java. It’s proprietary software developed and sold by Atlassian, and is targeted for and used mainly by businesses. Confluence has some features MediaWiki lacks, such as a WYSIWYG editor and integration with MS Office. Because Confluence is paid software, there’s a support ticket system for customers. Businesses who have the budget may want to consider investing in Confluence, although with time MediaWiki could be adapted to most business needs. 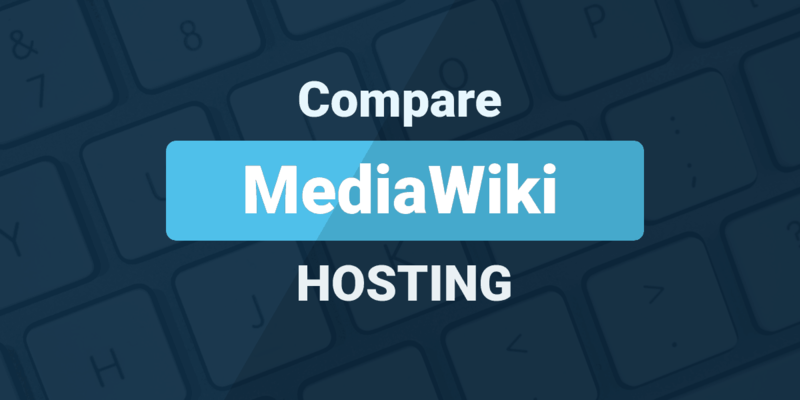 How does MediaWiki compare to TWiki? TWiki is a wiki application written in Perl, and mainly developed for the management of technical projects and educational papers. Like MediaWiki, TWiki is free and open source, licensed under GPL, and its functionality is also extendable via plugins. While they share many features, MediaWiki has a reputation for being more intuitive and easy to use than TWiki. What are the installation requirements for MediaWiki? In order to install MediaWiki on your web server you’ll need, at minimum, an Apache (or similar) web server; PHP; and either MySQL, PostgreSQL, or SQLite. If your chosen hosting plan doesn’t already include MediaWiki, you may want to contact your hosting company to make sure your plan meets the minimum requirements. Does MediaWiki recommended any hosting companies or plans? MediaWiki does maintain a list of hosts on their website, but they’re careful to note that they don’t guarantee or endorse any of the hosts on the list. Do any web hosting companies specialize in MediaWiki? Yes, several web hosting companies provide plans optimized for running MediaWiki sites. Many of them come with MediaWiki pre-installed, or offer easy one-click installation of the MediaWiki software. Some offer extra features like .wiki domain registration and automatic updates. There are also sites that offer free MediaWiki hosting for specific subjects, such as Gamepedia, where you can start your own gaming related wiki for free, or Biowikifarm, which specializes in biology projects.